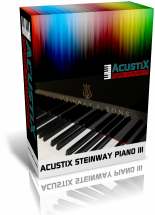 You can download a trial version of the AcustiX Steinway Piano. The AcustiX Steinway Piano is the result of the challenge to create a top-quality digital concert piano with breathtakingly rich and realistic sound, whose tonal precision and outstanding dynamic qualities rival those of a real, quality acoustic concert grand piano. The result is an awesome sampled piano with powerful bass, crystal clear mid-range and brilliant treble. Especially in the fortes, this piano is extremely bright, loaded with overtones due to sympathetic resonance. The AcustiX Steinway Piano was created with the smaller equipped music workstation in mind, without compromising on sound quality. This piano uses only 74 MB of carefully selected samples from 2 famous Steinway Grand Pianos blended together. This makes it the ideal choice for orchestration setups where the piano part has to survive between the other instruments tending to occupy a lot of acoustic space (piano concertos, pop, jazz, rock, hip-hop, blues). This piano sparkles on top of that. The AcustiX Steinway Piano is currently available in Kontakt format (SFZ and Halion sample formats are available upon request). To be able to use the piano, you need Kontakt 5 from Native Instruments. All samples are limited to 2 seconds. Total size less than 10MB. Despite these limitations, you will appreciate the quality of this trial version. It will give you an impression of what the full product has to offer. Enjoy. Important: This product is a non-player library and requires Kontakt Full Version 5 or later (it may also work with earlier Kontakt versions, so please test the trial version before buying). For Kontakt version 5.6.8 or higher, non-player libraries (i.e. libraries without a serial/activation protection), which cannot be used in Kontakt Player version) need to be loaded via the Kontakt files tab. Please see the video on our site for instructions. Please load the trial version via the files tab in your full version of Kontakt and check that you are not getting the "activation notice".